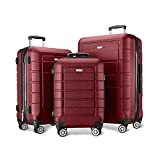 If you go traveling, you are probably familiar that the airlines have limits about how much luggage you're allowed to take with you—and how much it can weigh. You don't want to go to the airport and then be told that your luggage is too heavy. And if you're making a return flight and you purchased a few items abroad, you also don't want to get into trouble by having too heavy a payload. If so, a luggage scale of your own is a great convenience. Some of them are amazingly small, lightweight, and inexpensive. But there still are a wide range of features. 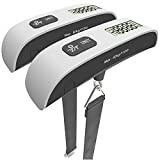 Here is a guide to the best luggage scales on the market. Digital scales: These are electronic devices that display the weight fairly accurately. They typically require one or two lithium ion CR2032 batteries. Mechanical scales: There are also analog spring scales with a dial face that can be used to measure luggage. 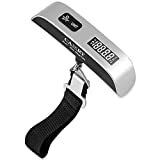 Although they don't have the accuracy of the digital scales, they can be more reliable (as long as you don't overstretch the spring by exceeding the scale's limit). 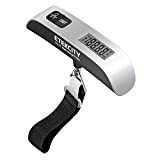 Not accurate for small weights: It's not recommended using these luggage scales for less than 1 kg weight. They tend to be inaccurate for small weights. Don't pick the luggage up too quickly: Making a jerking movement when trying to weigh the luggage will result in a faulty reading. Make sure that you are able to lift the luggage slowly and properly, before using the scale to weigh the luggage. Stores the reading: The best digital scales should save the weight reading, even after you release the luggage. This allows you to record the number. 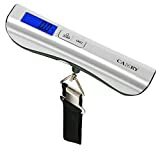 Generally the luggage scales will allow the weight to fluctuate, and then fixate on one number after having the same reading for three seconds. The Camry digital scale will flash three times, and then display the weight. Units: If you're more familiar with pounds than with kilograms, you should get a scale that displays both types of units (most airlines around the world will usually use the metric system). A limit of 32 kilograms is the equivalent of 70.5 pounds. Tare weight function: Some scales have a tare weight function. Tare weight is the weight of the luggage while empty. 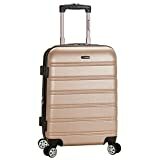 You can weigh the luggage with the scale, and set the zero point of the scale at the weight of the empty suitcase. 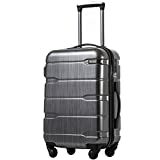 This way, you can calculate the net weight (the weight of the contents of the luggage). Note: Some digital scales do not have an automatic shutoff. In order to turn the scale off, you'll have to remove the battery! Otherwise, you run the risk of the battery losing its charge while not in use. You might have to have extra batteries on hand to make sure that the instrument will work. Double-check the weight: It's best to check the weight of the luggage twice, or even three times, to see that you get a uniform reading. You don't want a scale where the readings change too much from one measurement to the next. Checking the weight at the airport: If you have a luggage scale of your own, you can check it against the scale at the airport. If you'll be in the uncomfortable situation of having exceeded the payload limit, you can show them your reading of the weight on your scale, to prove your case. 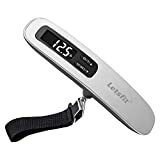 Temperature function: Some scales, like the Camry Luggage Scale also has a temperature sensor, which might come in useful when traveling abroad, and you want to know the outdoors temperature, and the temperature to which your luggage will be subjected. 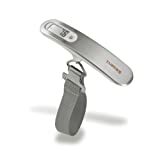 The Etekcity digital luggage scale will give the temperature in both Celsius and Fahrenheit. Camry—has been manufacturing scales since 1986. Their factory is located in Zhongshan, China, but their headquarters is located in City Industry, California. They make scales for measuring body weight, for commercial use, for use in the kitchen, and luggage scales. Etekcity—are retailers of home improvement goods, outdoors equipment, electronics, and office goods. Their main office is in Anaheim, California. They have a series of scales and meters for consumer use: multimeters, pH meters, bathroom scales, and more. 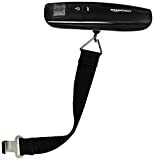 American Weigh—manufactures and distributes digital scales. They were founded in 2003, and are located in Norcross, Georgia. They make scales for laboratory and industrial use, as well as for shipping and consumer use. 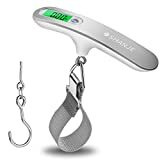 Their LS-110 Digital Hanging Scale can weigh up to 110 pounds, and has an accuracy of ±0.2 pounds. Smart Weigh—located in Chestnut Ridge, New York, are specialty manufacturers of digital electronic scales: they make bathroom, kitchen, pocket, jewelry, postal and luggage scales. They use innovative designs and materials in their products. 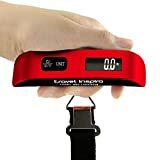 Their GO110 traveling scale has a comfortable grip, is lightweight and inexpensive.